Metal processing, in general, can be divided into two kinds: cold and hot processing. As the name suggests, the hot processing refers to processing materials after they are heated, such as hot rolled. In contrast, cold processing refers to process metal at normal temperatures, such as traditional turning, milling, chipping and grinding. Cold forming also belongs to cold processing. As a kind of processing technology, it has existed for a long time, but basically still belongs to an empirical discipline. Most cold forming technology is suitable for all metals, except for stainless steel, because firstly, stainless steel has higher strength and hardenability, secondly, stainless steel workpiece after cold processing is both functional and ornamental, which means it is crucial to protect their surface from damage and rust. Therefore, special techniques should be used for stainless steel cold processing and production. In the process of stainless steel forming, cold rolling technology and hot rolling technology are mainly used. Even in cold processing, there are many different ways to do this. The following is a brief introduction to some of the common cold forming methods for stainless steel. Traditionally, cold bending is widely used in stainless steel sheet and steel parts. 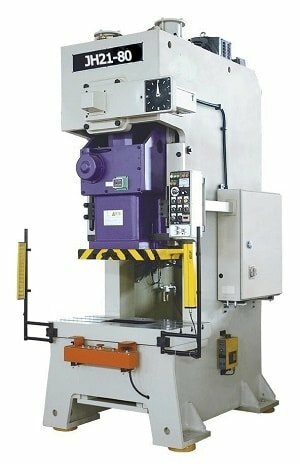 The punch press is basically open type single moving, mechanical or hydraulic transmission, with a long and narrow table. 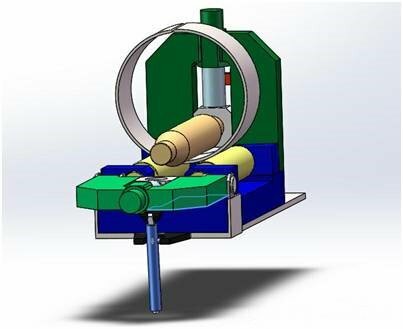 The machine can only produce linear parts, but skilled tool designers can also use it to produce complex shapes. The length of the parts produced by the cold bending presses depends on the original type and thickness of the stainless steel, the power of the machine and the size of the installed tools. Some large punch press, such as 11-meter standard 900-ton cold bending punch press, can produce austenitic stainless-steel workpiece with a length of 9m and a thickness of 8.0mm. In order to minimize the abrasion of stainless steel, the tool of the cold bending punch press is usually made of 12% chromium, and the plastic film can be used as further protection. It is very economical to use the general mold of cold bending punch press to produce small batch parts, but if special mold is required to produce special shape parts, the large batch is more economic because, in this way, the cost of mold can be reduced. With the development of technology, more and more enterprises are using cold bending forming technology to produce a large number of parts. The roll forming method is used to make the stainless steel into a complex shape with a series of the continuous frame, which is suitable for the production of the plate and special-shaped wire. 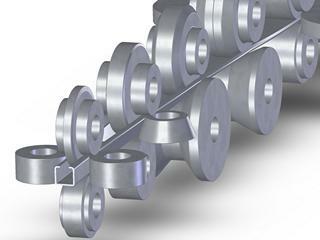 Roll order follows the principle of gradual deformation, automatic rolling, each frame of the roller gradually continuous rolls until the desired product shape formed. If the shape of the part is complex, it can be used up to 36 frames, but if the shape is simple, three or four frames are enough. The roller is often made of cold die steel, and the hardness is usually above HRC62. In order to ensure the smooth finish of the workpiece surface after rolling, the smooth finish of the roll surface is also highly required. It is the most economical to produce a large quantity of long – shaped parts by rolling. For the conventional plate mill, the width range of the strip can be processed is 2.5mm ~ 1500mm, and the thickness is 0.25mm ~ 3.5mm. For the conventional wire mill, the width of the wire can be processed is 1 mm ~ 30mm, and the thickness is 0.5mm ~ 10mm. The shape of the machining parts is varied from simple plane to complex and closed sections. In general, because the cutting tool, mold processing and equipment cost are high, it is economic to use roll forming only when the monthly output of stainless steel sheet is over 30000 meters or when the monthly output of stainless steel wire reaches more than 1000T. 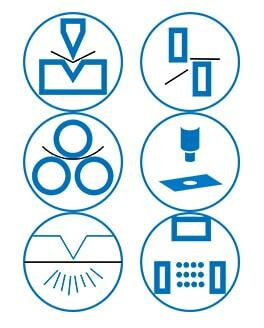 For the roll forming of either sheet or wire material, the smooth finish of raw materials surface must be guaranteed, and the mold surface must be regularly checked to prevent surface contamination and bruises, and the equipment also should be strong enough to bear the hardenability and high rebound margin of stainless steel under cold work. The technology adopts the punch and the die to produce the required product shape. Stainless steel stamping molding is common to see in the industry of stainless steel kitchen utensils production, such as stainless-steel pot, pen and handle of kitchen utensils. 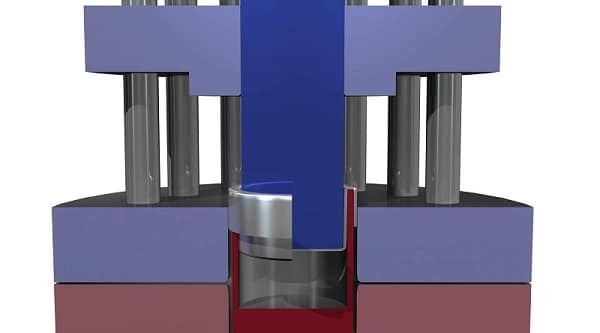 The punch press can be either mechanical or hydraulic, but it is best to use a hydraulic drive in the deep drawing because the hydraulic press can provide a full load of pressure in the whole deep drawing process. Most of the traditional technologies can be used for stainless steel stamping forming, however, because stamping stainless steel consumes over 60% pressure than that in low-carbon steel, the press frame should be able to bear such a big stamping pressure. In addition, it is also critical to avoid scratches, especially the high friction and high temperature of stamping stainless steel, resulting in scratches on the surface of the workpiece. Instead of commonly used soap or emulsion, specialized stamping oil or lubricating oil containing extreme pressure additives should be used. But on the other hand, as this kind of extreme pressure additives may cause corrosion of the stainless steel surface, the oil stains on the surface of the workpiece should be removed timely after stamping forming. 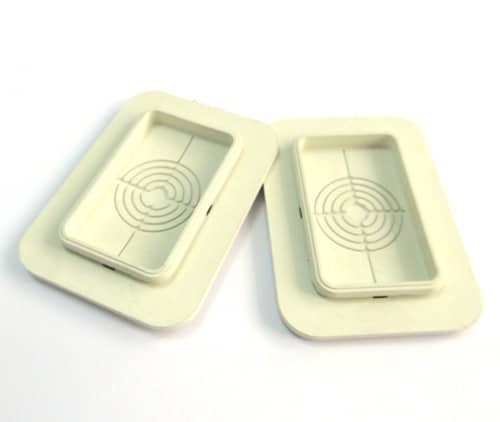 As the cost of stamping die processing is very high, the stamping molding is only used in mass production. Using rubber gasket forming technology can greatly reduce mold processing cost and can be used to produce small batch products. The molds used in this technique is made of materials with low costs, such as using hardwood or steel epoxy resin as the force piston and using rubber gasket as cavity block. Rubber can be solid rubber block or laminated rubber block, which is about 30% higher than the forming machine. When the molding machine is closed, the rubber block squeezes the stainless steel blank. When the molding machine is raised, the rubber gasket is restored and the rubber gasket can be used repeatedly. Rubber gasket molding cannot be used to make complex shapes, and the maximum depth of the parts produced is restricted. This technique is usually used to produce a small batch of stainless steel parts with the thickness below 1.5 mm. As a simple bending machine, the folding machine can be either manual or mechanical. 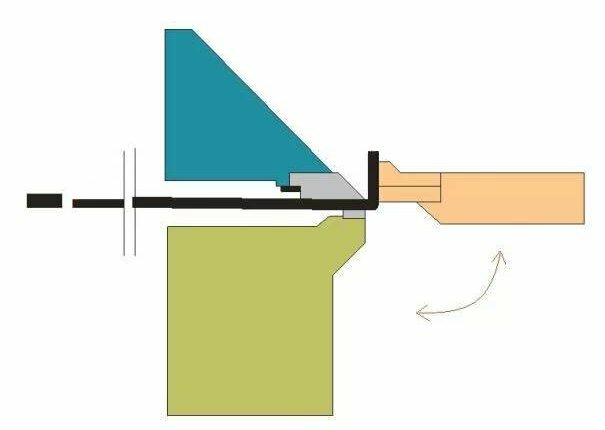 The simplest method is to use mold with bending radius to fasten steel plate firmly on the machine tool working table, protruding part material on another workstation, and the table can rotate along the center of bending radius. When the table rises, it bends the stainless steel to the desired angle, certainly, when bending, the stainless steel slides on the worktable. Therefore, to prevent stainless steel from scratches, the surface of the workbench must be smooth. In the actual processing, the plastic film is usually used to protect the stainless steel surface. The upper beam is usually wedged to form a gap, which can be folded into a quadrilateral box or groove with an appropriately shaped blank. The flanging machine has been used to produce stainless steel sheet products with large size and simple shape, but these products are now usually produced with cold bending presses. Curved plates are usually used to produce a variety of thin plate cylinder or cylinder segment. The traditional rolling machine has a pair of adjustable rollers, which can be adjusted according to the thickness of the steel plate. The third roller, namely the bending roller, controls the diameter of the cylinder body. There is also a variant of this machine, which uses three rolls as well, and the configuration of the roll is a pagoda shape. The bottom roller is the driving roller, and the top roller is rotated by the friction generated between the top roller and the workpiece. The bottom roller diameter is usually half that of the top roller. The minimum diameter of cylinder produced by the above two kinds of equipment is the diameter of the top roller plus 50 mm, while its maximum diameter depends on the size of the material, the rigidity of machine and parts. Under special circumstances, the cylinder has to be supported by frames. In the real life, each product can be processed in different ways. It often requires the combination of various methods or different processing methods to form the same quality products. Therefore, we must correctly understand stainless steel cold forming methods so as to use them properly in life. (1) The flaws like dirt, scratches, pits, pitting or double skin on the surface of roughcast materials to be processed will be worsened in the process of cold forming, which will make the product dirty, rust, partially crack and damage the mold and thus reduce the rate of the finished product. Therefore, before forming, the surface condition of roughcast materials should be carefully checked to ensure that they are clean, flawless. (2) As the forming mold and work platform are dirty, the metal fragments adhered to the surface cannot be cleaned in time, resulting in dirt, rust, pits and scratches on the surface of the workpiece. In order to avoid this phenomenon, we should regularly polish the mold to ensure their cleanliness, and keep the processing equipment and workshop clean. (3) Some forming techniques make a sliding contact between the metal. In the process of forming, local high pressure can damage passivation coating of stainless steel, and is possible to weld the stainless steel surface without protective layer to tool surface by cold welding. When the solder is broken in the slide, the tool surface, the mold surface with scraps will cause a serious scratch on the surface of the stainless steel. This is to say, the molding equipment should be protected in good condition, and the operator is required to be skillfully and cautiously enough to avoid the sliding of material. (4) Stainless steel has high strength, of which, the austenitic stainless steel also has obvious cold hardenability. In the process of cold forming, if the deformation is too big, it can lead to fracture of the workpiece, or even to damage the mold and machine equipment. Therefore, in production, the rigidity of workpiece should be tested, maintaining reasonable deformation quantity so as to meet the demand of production efficiency under the condition of ensuring product quality. (5) After cold forming, the passivation coating of stainless steel surface will be damaged, and be attached to stamping oil, debris of mold and other metal, which can easily cause corrosion. In order to make the finished workpiece with good stainlessness and smooth finish, it is necessary to clean oil stains and process passivation, and if possible, the surface of the workpiece can be protected by the plastic film. As the demand of stainless steel increases, the cold forming technologies of stainless steel are becoming more and more widely used. We should, under the condition of ensuring product quality, choose suitable forming technique as per the different features of the product, maximize the production efficiency, reduce production cost, so as to provide consumers with cheap and fine stainless steel products.